A woman lost control of an SUV on Interstate 95, causing it to careen out of control and topple over onto its side. The wreck occurred on northbound I-95 outside Vero Beach. According to investigators, the driver lost control of her vehicle in the center lane. The SUV eventually came to rest partially in the outside lane and partially on the shoulder. One woman, who was not wearing a seat belt, was ejected from the SUV. She died almost instantly. The other three occupants were properly restrained, yet they still sustained various serious injuries. Florida Highway Patrol troopers ruled out alcohol impairment, but they are unsure what caused the crash. Few if any reliable statistics reflect the number of injured drivers as opposed to the number of injured passengers. But passenger injuries are quite common, and they are just as serious as driver injuries. 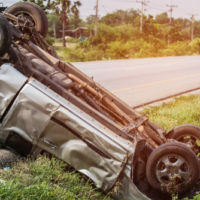 It’s possible for a passenger to file a legal claim against a driver, especially if the victim is injured in a single-car collision like the one described above. Obviously, if there is any personal relationship between the victim and tortfeasor (negligent driver), a lawsuit will probably sever such ties. Voluntary Assumption: The distinction between voluntary and involuntary is not always so clear. If Brian volunteers for the Army to avoid being drafted, was his act really voluntary? Or, if Jane signs a waiver because it’s the only way for her to use her gym membership, is the waiver truly voluntary? Similarly, if the victim gets into the car with the tortfeasor because s/he has no other way home, was that act purely voluntary? Insurance company lawyers use defenses like this one to reduce or deny damages to the victim. In a serious injury crash, these damages usually include compensation for economic losses, such as medical bills, and noneconomic losses, such as pain and suffering. Florida is one of only a few states that officially recognizes this doctrine. In the Sunshine State, if the victim was not wearing a seat belt, that non-use can be grounds for reducing the victim’s damages. But to invoke the defense, the insurance company must do more than wag its finger and introduce some safety statistics. The defendant must normally introduce evidence that the victim’s failure to use a seat belt directly and proximately caused certain injuries. The medical expert must also usually testify that proper use of a seat belt would have prevented these injuries. Florida is a pure comparative fault state. So, if the jury concludes that a seat belt would have prevented 20 percent of the victim’s injuries, the victim is still entitled to 80 percent of the compensation awarded. Injured passengers may be entitled to significant compensation. For a free consultation with an experienced personal injury attorney in Port St. Lucie, contact Eighmie Law Firm, P.A. We routinely handle cases all along the Treasure Coast.